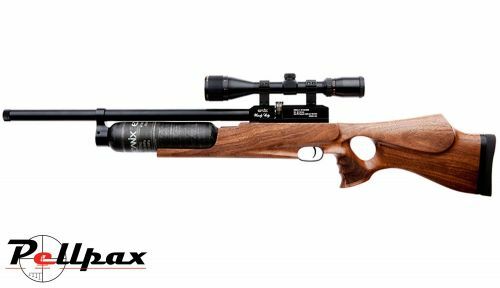 The Windy City is a high quality, pre charged pneumatic air rifle from Evanix in Korea. Some of the key features of this rifle are the large, 480 cc Carbon Fibre Bottle, which gives a massive shot count of close to 350 shots in .22, and gives the rifle perfect weight distribution, and the smooth, side lever cocking action that reloads the next shot with a flick of the wrist. The rifle is stocked in a high quality Sepetia wood, and with the ergonomic contoured grip, this rifle is very easy to hold and comfortable to get a great shot. The Shrouded barrel on this rifle makes it almost whisper quiet, and when a silencer is fitted it is barely audible. The rifle is also topped with a 9-11mm scope rail to make fitting of optics simple. Scopes and mounts not included.